How long has MikuMikuDance been around? What is the purpose of MikuMikuDance? What does MMD mean to people? This Monday 2.24.2014, will mark the Sixth anniversary of MikuMikuDance. I personally find it hard to believe that a program that has allowed so many to create their visions has been around for so short a time. A.) What does MMD mean to you? B.) How has MMD affected you and your life? MikuMikuDance encompasses MANY of my interests … and using MMD in the way that I do utilizes my creative skills and my imagination in ways no other “hobby” has done. And it’s not just me … EVERY MMDer approaches that blank, white window in the MMD GUI control panel and applies his/her own mix of creativity and life experiences to create unique, one-of-a-kind artistic images. I think it’s the outpouring of human creativity and emotion on a global scale that most excites me about MikuMikuDance and the MMD Community. How’s it changed my life? With the creation of LearnMMD.com, I am LIVING MikuMikuDance, every day. Aside from my “couple of hours a day and eight hours on Sunday” that I spend answering comments and emails and attempting to keep up with the posts and emails of our fifteen authors, I find I am “keeping an eye open” for scenes and events in my daily life that might easily translate into a new MMD project. I visualize little skits or gags that would work well … or I envision a new way to move an accessory to get an effect to match something I just saw happen on the street … that kind of thing. … thinking about MMD all day long. MMD means sharing. It means community. It means having a hobby or having a career depending on your living quarters. It passes the time for the young and restless and gives purpose to the old or bored. It’s an evolving art form that has no limitations. 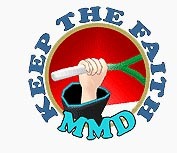 MMD has given me hundreds of friends, followers, admirers and even a few enemies. It has given me inspiration in times when I was stuck. It has made me laugh, cry, and become frustrated or elated. Without MMD I fear I would not have found a more engrossing medium to spend time on as a hobby. MMD has been a beloved program for me from the first time I get my hands on it and now it has been a quite a significant part of where I spent my day to day time. But in all honesty, I won’t say that it means everything to me. It’s just a really good medium for my creativity to transcend from my head into a visual realm. Actually, MMD has affected quite a few things in my life. It actually cures my addiction to MMO games lol. Back then I always play MMO games anytime I had a free time, but now I prefer tinker things out with this program. And MMD actually help me on my real life work as a lecturer. It made animation related-topic easier to explain such as movement how-to and sometimes i even put MMD on my curriculum just to let the students have some fun and as an introduction to a simple 3d animation realm before going further. 1. MMD to me means a ton. It’s such a fun program to use, and being able to see others and my own works come together is amazing in itself. 2. Personally, I tend to use MMD for a lot of venting. It makes me feel a lot better after throwing together a photo or video. You definitely learn a lot from MMD and the community itself. I don’t think I would have ever had any interest at all in 3D animation if I wasn’t dragged in by Miku dancing to silly songs. It’s certainly what brought me and some of my closest friends together. Most of my online friends, we met through the MMDC. 1. MMD is really just a hobby. I found it fascinating primarily because it is comparatively easy for me to make “stuff” (models) for it and to use for things like creating scenes for my stories and cartoons. I’ve done some animations, too. MMD makes it reasonably easy for a total novice – well probably not a total novice – for people with at least a basic idea on how computer animation works, to get very good results fairly easily. Overall, it allows for a lot of creativity and there’s enough of a talent pool in the global MMDC to allow for a lot of things to possible from a single PC station. It’s fun. Especially if you like making things and tinkering with “stuff” like I do. 2. It hasn’t – it’s just a hobby. 1. As the name suggest, MMD is the product of the Vocaloid-culture/Miku-culture. Since it is creation software, it embodies the goals of the culture, collective creativity and the inspiration of creativity. Additionally, the vocaloid-culture wouldn’t be as big as it is without the internet. As the recent Google Chrome commercial illustrates (https://www.youtube.com/watch?v=MGt25mv4-2Q), “Everyone, Creator – the web is what you make of it”. With MMD it allows users, even those lacking in the creative field as I am, to contribute to the phenomenon and expresses oneself creatively. 2. MMD allowed me be more interested in 3D animation/modeling and exploring other forms of 3D animation such as Blender 3D and Google Sketch-Up. I wouldn’t be a part of the MMDC if it wasn’t for Arizona dragging me in and foster a good friendship we have now. 1. MMD for me is a place where I can relax and release my creativity, like nowhere else can. Sure, it can be stressful, but in the end, effort gives results. 2. MMD has affected me in many ways; it has given me friends I never would have met otherwise, experience that would have been unattainable, and I’ve gotten more confidence in myself and my work. MMD means that I have another venue to challenge my creativity. I have some stories I need to tell. I now have a cast of characters; stages; music and the means to direct it all. There are still many things I have to learn. This is what pushes me forward. MMD has changed my life in so many ways! I get to write for this wonderful site. I have corresponded with some fantastic and talented people around the world. I get to see some great videos made by others using the same program. I feel that I can add my voice to this diverse and magnificent choir. Above all, this is just a whole lot of FUN!